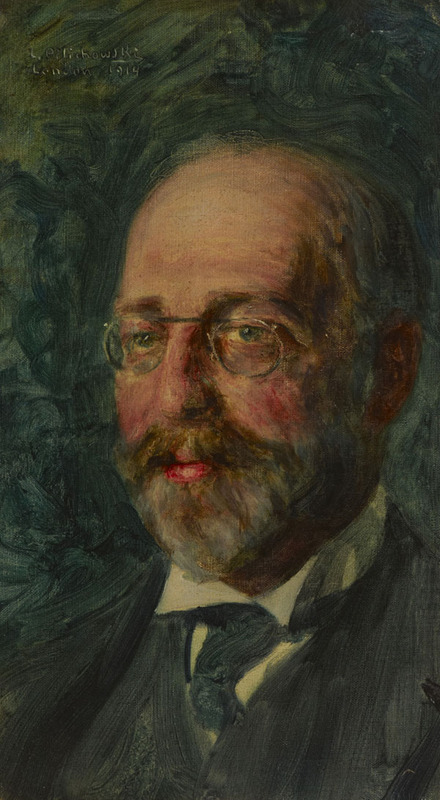 The sitter, Elkan Nathan Adler (1861-1946), son of Chief Rabbi Nathan Adler and brother of Chief Rabbi Hermann Adler, was an author, lawyer, historian, and bibliophile, amassing an impressive collection of Jewish books and manuscripts. His extensive library was sold to to the Jewish Theological Seminary of America in New York City and Hebrew Union College in Cincinnati in 1923. Adler was the first European to explore the documents stored in the Cairo Genizah, collecting and bringing to England over 25,000 Genizah fragments from his visits in 1888 and 1895. He was also a specialist in the history of Persian (Iranian) Jews.